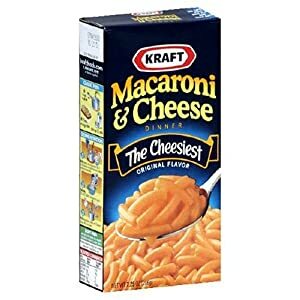 Kraft Mac n’ Cheese or Kraft Dinner as it is also referred to, seems to be the thing that most of my American ex-pat friends crave the most outside the USA. They beg returning travellers to slip those familiar blue boxes in their luggage or pay ridiculous prices for it in Selfridges food hall. Their eyes glaze over with wistfulness when they mention it. How could I resist trying something so iconic? So on a grey rainy Sunday evening, after a few cocktails the previous night, I decided it was time to try the ultimate comfort food and open that box of Kraft Dinner in time for Come Dine With Me. Firstly, I was alarmed to see that since the macaroni and cheese sauce are separately packed, you have to make the entire 3 serving box in its entirety. Even as a great lover of macaroni cheese that seemed excessive. Secondly, the macaroni seemed to stick together the instant I added it to the boiling water and no amount of stirring seemed to help. Thirdly, while my pasta lump was cooking, I was horrified to see that the serving instruction was to use 4 tablespoons of margarine to make the cheese sauce. For a real butter lover those instructions felt like sacrilege. I was slightly relieved to see that the ‘Light Prep’ involved 2 teaspoons of butter and the same amount of fat free milk. Pondering why anyone would willingly add that much margarine to anything, I drained the macaroni. I added a 1/4 cup of semi skimmed milk to the pan along with a lump of salted butter and opened the foil sachet of cheese sauce powder. Believe me when I say the last time I saw anything that unnaturally lurid in colour, it was being worn by a eager young thing en route to a Nu Rave night. Luckily stirring it into the milk and butter rendered it normal enough coloured to consider eating and it looked almost palatable by the time the macaroni was stirred in. I put the whole mountain of mac n’ cheese in a bowl and added some black pepper for extra favour. I was slightly concerned to see that by the time I had sat down to eat, it had begun to congeal slightly in the bowl, adding an extra dimension of unappealingness to it all. Undaunted, I dug into the dish, only to discover it looks better than it tastes. I’d say it tasted like sick, but at least sick has a definable flavour. This was offensive in its sheer blandness. It didn’t even taste of salt, let alone cheese. The macaroni was limp and wet with absolutely no texture or bite while the sauce was just tasteless with a unpleasant hint of oiliness. The whole thing was simply like milky semi digested pap. By the time the good folk of Come Dine With Me had reached their first starter, I had had enough. Having tasted this dreck, I cannot imagine how miserable you must be feeling for Kraft Macaroni and Cheese to classify as comfort food. Everything about it is an insult to the real thing. Any craving for processed cheese I had after reading this paean to it has been obliterated. After this crushing disappointment I doubt I will ever risk trying an egg cream or a funnel cake in the future. I’m not sure I could take the shattering of another childhood dream after this debacle!